After three years of cooperating in the Israeli blockade of Gaza,Egypt said Monday that it will leave its border with the Palestinian territory open indefinitely for humanitarian aid and restricted travel. 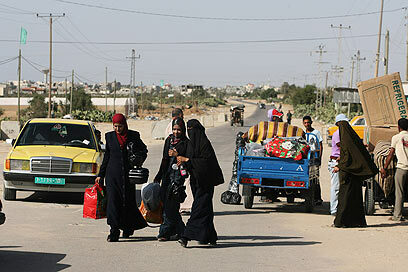 On Tuesday a group of nine Egyptian parliamentarians entered Gaza through the Rafah crossing. The group includes two members of the Arab Democratic Nasserist Party and seven Muslim Brotherhood members. Two of the Brotherhood members took part in last week's sail to Gaza. The delegation members, who are visiting the Strip "to express solidarity with the residents of Gaza," are expected to meet with senior Hamas figures. The US, which has called the current border restrictions unsustainable, is among those pressing for changes. Vice President Joe Biden met Monday with Egyptian President Hosni Mubarak in the Red Sea resort of Sharm el-Sheikh. He released a statement afterward saying the US is closely consulting with Egypt and other allies to find new ways to "address the humanitarian, economic, security, and political aspects of the situation in Gaza." In announcing the change in Egypt's position, a security official acknowledged his country was in a "continuously critical situation," and he said Israel was wrong to think the closure could pressure Hamas to meet a series of demands, including the release of kidnapped soldier Gilad Shalit, who has held since 2006. "Israel still insists that the blockade is a pressure tool. It can release Shalit and force Hamas to stop resistance. ... On the contrary, it becomes more extremist," said the official, who spoke on condition of anonymity because of the sensitivity of the issue. Egypt's new measures constitute an incremental change rather than a radically different approach to the border closure, in part because Egypt does not want to end up bearing sole responsibility for large-scale Gaza aid operations. Egypt will not transfer large cargo shipments or construction material because the border crossing is designed primarily for travelers, the security official said. One such convoy, organized by Egypt's Islamic opposition movement, the Muslim Brotherhood, was stopped Monday before it got close to the border. "We have said since the first day that the blockade on Gaza will end, and we can see that on the ground right now. And we voice our hope that all other restrictions will be removed," Hamas spokesman Fawzi Barhoum said. Prime Minister Benjamin Netanyahu has signaled in recent days that he is open to easing the blockade, but cannot allow ships to sail freely into Gaza's port, fearing weapons will reach Hamas terrorists. Netanyahu's spokesman, Mark Regev, said officials are considering various ideas but declined to elaborate. See all talkbacks "Egypt confirms: We broke Gaza blockade "